Since the age of 15, Piet Haven wanted to be on stage and found out pretty soon the guitar, his voice and acting skills where the better means (compared to being an acolyte). By then Neil Young, Kansas, Scorpions, Saga, Clannad, Yes, and many others were his heroes and inspiration. Always being his own teacher he had the chance to play with great musicians (Raph Van Goubergen, Jo Ysebaert, Koen Deca, Els Artois, Zohra…) who shaped his experience and improved his composing skills. With Raph and Els he formed the jazz combo Someone Els. 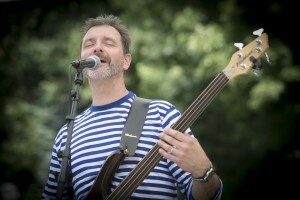 Being a former rock singer, keyboard player and guitar player (4′ too late), bass player and vocalist in a number of cover bands (WAS, Delay 99 , KIFKIF , Charly & the Checkpoints) and by having been the bass player of the acoustic 4 male singers band Brasso Gitano, co-composing their songs and writing their lyrics, it is no wonder Piet can do his thing and can further explore his musical talent with the other members of Masala. Together with them he can combine his styles and influences from over the years … and go far beyond.